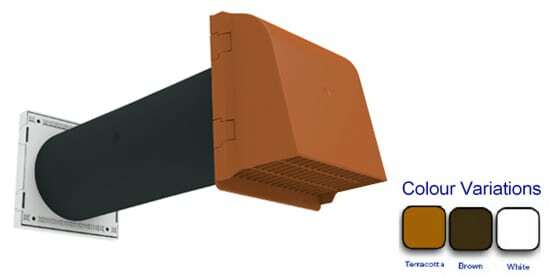 The VENT Core Vent – G900 is designed predominantly for use when ventilating a gas appliance, although it can be used to supply general through-wall ventilation as well. The kit includes a cowl vent for exterior use, a louver grille for interior use, a 350mm length of pipe duct and an optional anti-draught baffle which reduces the airflow and also the feel of a draught through the vent. Without the use of the anti-draught baffle, the free area of the vent is 100cm², enough to supply an appliance with a rated input of 27kW or 92,000 Btu/h. With the anti-draught baffle installed, the effective free area of the vent is reduced to 70cm² providing enough ventilation for an appliance with an input rating of 21kW or 71,500 Btu/h. The vent can easily be fitted in both refurb and new build situations with the use of a 5” (127mm) diameter core drill.